Imagine this, it’s 3 AM and you’ve finally sobered up. Right now, there’s only one thing on your mind; finding a job. But with so many job portals out there, where do you go to find your next one? 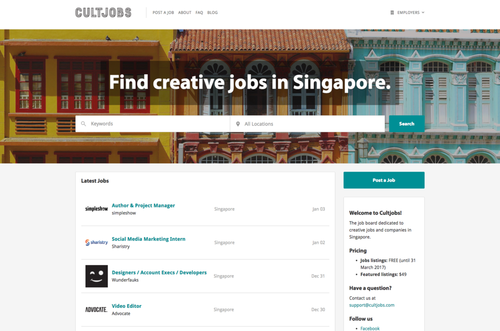 We’ve listed some of the most popular website's average, everyday Singaporeans use to find their next job. Ready? Find out more below! FastJobs is the perfect website for those looking for a job real fast. You’ll find all sorts of companies advertising their latest openings here, from fast food restaurants to popular luxury brands. You’ll be able to search for ads written in both English and Chinese. Other features include filtering for jobs according to various locations (e.g. Bedok, Tampines, Ang Mo Kio) in Singapore. 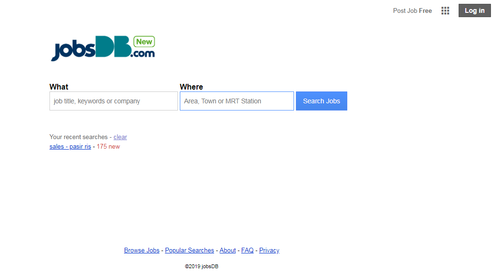 JobStreet is one of the “biggest” job search websites in Singapore, with an enormous database of jobs from various companies. SMEs, startups, and even government organizations advertise their jobs here. With JobStreet, you won’t be hard-pressed to find a job that you’ll like as there are thousands of job ads available for your picking. You can also filter job advertisements by “Minimum Salary”, “Direct Employers”, and “Recruiters” - a pretty cool feature in our opinion! 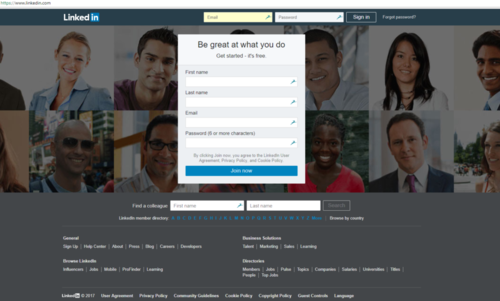 Linkedin is no longer the website for networking and showing off your all the awesome job opportunities you’ve had. You can now search and apply for jobs on the website. Cool features include the ability to receive daily job alerts and the option to filter job advertisements by, “Easy Apply”, “In Your Network”, and “Under 10 Applicants”. To sum it up, Linkedin is a great website for those looking to level their careers up. With networking and job searching opportunities, as well as career tips and tricks to guide you throughout your career. With 30% of all Google searches being employment related, it really is no surprise that the company has expanded to helping users job search. It is really simple to use Google Jobs, simply type in the job you’re interested in (e.g. “marketing jobs Singapore”) for a list of different marketing positions pulled from various websites. There are options to narrow down job listings based on your desired location, date posted, job title, and employer to name a few. 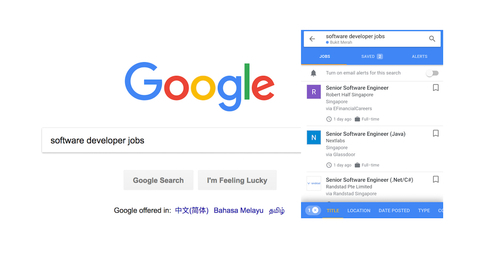 To streamline your job hunt process, each Google Job listing will feature the job’s salary information (if available), Glassdoor rating and job information. Other cool features include the ability to save and bookmark the job listings you’re interested in. Cultjobs advertises to those looking for a creative or niche position within the art, film, fashion, music, and graphic design fields. Other roles within the admin, marketing, sales, and IT field are also available for the less creatively gifted. Internships are also available. The site is pretty bare bones and basic. There is an option to receive job alerts for specific roles via email if you’d like. Cultjobs has also compiled an FAQ section should any online issues pop up. There is a medley of Facebook Groups out there dedicated to job advertising. Besides being convenient, applying for jobs through Facebook can result in faster and quicker results than traditional methods of job application. With thousands of people in the group, there is never a shortage of positions available for your picking. One major downside to applying for jobs via Facebook is the potential to be scammed. Unlike other job websites, you can’t search for specific roles within each group. Those applying with their very own Facebook accounts may not receive a callback, as employers or recruiters may not choose to hire you based on what you post on your social media accounts. Carousell is known for its reputation as an online marketplace. 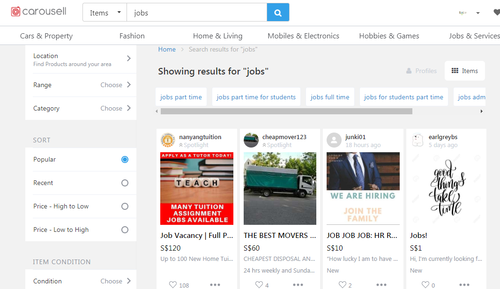 If you’re already using Carousell to hunt for concert tickets, sneakers, or other awesome second-hand items, why not expand your search and look for jobs on the website instead? A simple search for “jobs” on Carousell revealed a number of short term jobs. Salaries featured range from $8 — $20 per hour; which isn’t too bad a pay for a short term position. Unlike other job search websites, Carousell allows you to advertise your services so that other employers can find and hire you. JobsDB is a website known for its wide database. Reviews have likened JobsDB as one of the best-known job search sites. It’s wide database aside, JobsDB features a range of companies from startups to larger, more well-known companies. Much like Google Jobs, you’ll be able to narrow down your job ads by “Listed Date”, “Job Type”, “Job Title”, “Source”, and “Location”. The latter is an important feature to most, as you wouldn’t want to wake up in the wee hours of the morning, to travel from Pasir Ris to Jurong. If you’re looking for a place where all the recruiters congregate, Monster is the website for you. In this website, you’re able to narrow down the range of jobs available by function, industry, skills, length of job, and even by gender. In a bid to encourage more jobseekers to upskill themselves, the website also lists courses you might be interested in. Monster for courses works a lot like its job search counterpart, you’ll be able to narrow down your search by “Course Type” and “Category”. Other unique site features include a section called “Career Tips” that provides you with help for salary negotiations, resume and cover letters, as well as second career options should you choose to leave your current industry. We reckon that you’ll also be fascinated by the website’s paid resume services, as well as its psychometric quizzes. If you’re looking to engage the help of some industry professionals to aid you during your job search, going directly to a recruitment website could be your best bet. Recruitment websites such as BGC Group, or even your Polytechnic sites (Singapore Poly, Nanyang Poly, Ngee Ann Poly, Temasek Poly, and Republic Poly) are host to a number of jobs. There are a number of benefits to applying directly via a recruitment website. Benefits include the ability to save time, resume and interview tips, as well as the inside scoop on the upcoming jobs available! Why not outsource your precious time and get a recruiter to help you with your job hunt for free instead? Liked this article? Check out these awesome reads below!